Cosmetic surgery, also known as aesthetic surgery, is an elective operation that involves improving a person’s appearance. Such operations include liposuction, breast augmentation, rhinoplasty, blepharoplasty or eyelid surgery, and rhytidectomy, also known as a face lift. The most popular surgical cosmetic procedure worldwide in 2016 was breast augmentation, followed by liposuction and eyelid surgery. The most popular nonsurgical procedures included botulinum toxin, or botox, hyaluronic acid, hair removal, and photo rejuvenation. In 2017, the United States was the country with the highest number of cosmetic procedures worldwide, with over four million such operations. The number of both surgical and nonsurgical cosmetic procedures in the U.S. has grown over the last decade, from around 1.6 million procedures in 1997 to almost 4.8 million in 2017. Those aged 35 to 50 years are the most likely to have surgical or nonsurgical cosmetic procedures, accounting for 39 percent of all procedures in 2017. Geographically, around 26 percent of all cosmetic procedures occur in the South Atlantic region, including Delaware, Florida, Georgia, North and South Carolina, Virginia, and West Virginia. 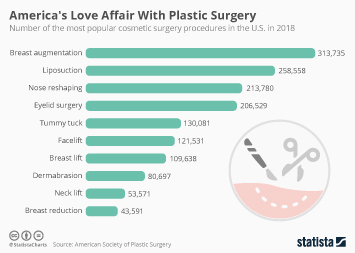 The leading surgical cosmetic procedures for women in the U.S. in 2017 were breast augmentation, liposuction, and breast lift, whereas the leading procedures for men were liposuction, eyelid surgery, and gynecomastia. The cost of such procedures can be substantial, with total expenditure in the U.S. exceeding 8.5 billion U.S. dollars in 2017. The average cost for liposuction that year was 3,279 U.S. dollars, while the average cost for a facelift was 7,562 dollars. Although cosmetic surgery, much like any surgery, can be physically damaging, patients of popular cosmetic procedures in the U.S. report being generally satisfied with their results. In 2017, an estimated 97 percent of tummy tuck patients and breast augmentation patients stated they would do the surgery again. Concerning nonsurgical procedures, 95 percent of those that had botox would do it again, as well as 92 percent who had laser hair removal.